Currently reading: It’s still steady-going with Becoming Madame Mao by Anchee Min. It’s not engrossing me as much as I would like and I keep waiting to be swept into it, but I’m almost halfway through and it’s not happening. I’ll keep pressing forward! I’m obsessed with Simon vs. the Homo Sapiens Agenda by Becky Albertalli. Simon’s voice is so perfect, I’m loving it. Honestly, it’s making me feel like my YA novel is never going to get published if this is the standard I have to stand up to. I’m finding excuses to drive around so I can listen to this. I’m getting toward the end of The Power by Naomi Alderman and finally starting to see where it’s going. There are jumps forward and backward in time and they slowly merge into a big event. I’m getting close to it now. I think it’s safe to say this one will be finished next week. I started reading Hawkes Harbor by S.E. Hinton. Hinton is the author of one of my all-time favorite books, The Outsiders so I’m excited to pick up something new by her. This one is relatively short so I hope it doesn’t stay on this list very long. Recently finished: I’m happy to say I finished Midwives by Chris Bohjalian. This one had me staying up late to read just a few more pages each night and I think I frustrated my husband by keeping the light on later and later. There’s a movie of this one and I can’t wait to see it. What a complicated issue Bohjalian created. I think it will play out well on screen. I was able to post one review this week, Dodgers by Bill Beverly. My book club met this past week to discuss it as well so I’ll have another post about this one coming up soon. I enjoyed the book but the discussion actually brought up a few issues I hadn’t thought of before so I’m really glad for this group of people who have challenged me to think more about books. Reading Next: I still plan to pick up Survival in Auschwitz by Primo Levi as a physical book, I’ve just pushed it back one. I’ll get to this when Hawkes Harbor is done. My next eaudiobook will be The Sleepwalker’s Guide to Dancing by Mira Jacob. This book was hyped a lot a few years ago and I haven’t heard much about it since but it’s lingered on my TBR all the same. I think it may finally be time. I tend to listen to ‘bad summer books’ in the summer. I’m going to start on A Storm of Swords by George R.R. Martin. This will be a long endeavor to be sure, but I’m ready for it. I’ll be caught up to my husband finally. And it will be good to be catching up on the books as the show ends. Currently reading: It’s still steady-going with Becoming Madame Mao by Anchee Min. I only had two lunches last week to read and this week isn’t looking better. I’ll keep making my way through, though. No rush on this one. I’m really enjoying Midwives by Chris Bohjalian. I squeezed a little extra reading time this weekend even though I couldn’t afford it. I hope to finish this one soon and not have it linger on this list for more than one more week. I got my hold on Simon vs. the Homo Sapiens Agenda by Becky Albertalli and was finally able to start it! I hope I have some long drives to get through this one quickly because I’ve been waiting for it forever! I started reading The Power by Naomi Alderman on Sunday. Not too far into this one yet. I’m excited to stay one step ahead of my book club, though! We didn’t get our copies of this until Monday. Staying ahead is letting me focus on books I want to read, not just those for groups. Recently finished: I was able to finish up News of the World by Paulette Jiles which was a lovely little book. I hope I remember it well enough for our next meeting because it seems so far away. I’ll get around to a review at some point. I feel so behind in reviews that it could be a week or two before I finally get to it! Better this than struggling for content, though. I finished Daughter of Smoke & Bone by Laini Taylor Sunday morning. I enjoyed the story but it’s clear this is the first of a series. It was very unfinished and I was a bit disappointed. I hoped there was something more I would get before the book ended, but it was a set-up for the next books. I’m still debating if I’ll finish the series. I posted two reviews this week. The first was for Thunderstruck by Erik Larson. Not a favorite read, but a solid one. I enjoy Larson’s style but this topic didn’t grab me as much as earlier ones have. I’ll have to try again soon. I gave the book Three out of Five Stars. I also reviewed Wonder by R.J. Palacio. This book was a joy for me and I hope I can see the movie soon and experience it all over again! I gave the book Four out of Five Stars. Reading Next: I’ll grab another book off of my shelves next. I’m feeling great about getting through so many! Next up is Survival in Auschwitz by Primo Levi. I added a number of concentration camp memoirs to my TBR after listening to Anne Frank’s diary a few years ago. This one was a little harder to come by but I have a copy and I look forward to reading it! Currently reading: I made a little headway with Becoming Madame Mao by Anchee Min but not much. I’ll be on this for a while, to be sure. I’m still getting used to the style, how it switches from first-person to third-person. I’m not sure I like it yet. I’ve gotten to halfway through Midwives by Chris Bohjalian. I haven’t been reading as much before bed because I’m making sleep a priority and getting to bed earlier. It’s been great, but it is eating into reading a smidge. I’m really liking Daughter of Smoke & Bone by Laini Taylor on audio. It’s getting really interesting and keeping me listening as long as possible through each workout. I might be on to a series I’ll finally finish! Since News of the World by Paulette Jiles is so short, I’m making great progress with it. I should have this one wrapped up later this week at the latest! Recently finished: I knew it was coming so no big surprise here: nothing new finished this week. I killed it in March so I’m not surprised with a small slow down. Though I do expect more books finished next week! Also no reviews this week. I’ll be back at them next week so don’t worry! Reading Next: I’m still waiting for Simon vs. the Homo Sapiens Agenda by Becky Albertalli. I’m getting anxious since I’ll be ready to start it very soon. I’ve got my fingers crossed it comes in this week! Currently reading: I’ve been really enjoying Wonder by R.J. Palacio. The way the plot is told is really engaging and I like how each character reveals a bit more about the plot. It’s making me want to drive around just to listen more. I began a new ebook and decided on Becoming Madame Mao by Anchee Min. This was one that was recommended by my page-a-day book calendar in 2013. I’m still working that calendar off. Maybe once every ten years will be good for another one. My book club’s next pick is Dodgers by Bill Beverly and I’ve grabbed it on audio. I don’t know anything about it, really, I’m just going in blind like I normally do. I’m so early into this one that I’m not ready to form an opinion yet. More to come. I’m making a great effort to tear down my TBR mountain and I’ve started another one from the list, Midwives by Chris Bohjalian. I’ve been reading Bohjalian for a few years now and my copy of this one is actually autographed. I’m keeping my fingers crossed but I’ve got a feeling this break-out hit will be a win with me. Recently finished: I finally finished Origin by Dan Brown while I was waiting for my computer to update on Friday. I didn’t realize how close I was to finishing it. I’m glad to be caught up on the series and I’m excited to see what else comes next from Langdon. I’m sure there’s more to tell. I gave the book Four out of Five stars. A review will be up next week. I was able to finish This Is a Book by Demetri Martin quickly. It was a fun book of essays, drawings, and lists. Not much substance to it but fun all the same. I gave it Three out of Five stars. I think I’ll have finished Thunderstruck by Erik Larson by next week. I’m getting through it pretty quick with my long bike rides. It’s not my favorite thing to listen to while riding because it’s so technical, but I can tell the plots are about to intersect and I’m excited to see how. And so many reviews as well! I was first able to review Books for Living by Will Schwalbe. This one was really touching and a great book for book lovers. The post went up last Thursday, please go check it out. 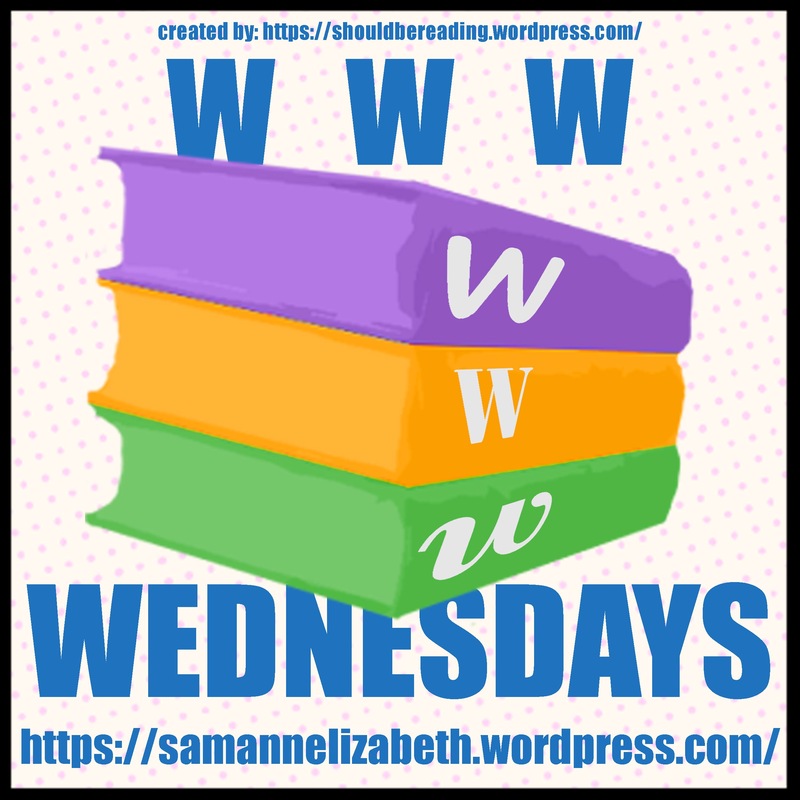 I also reviewed The Wednesday Sisters by Meg Waite Clayton. This was a surprise winner for me and I’m so glad I finally gave it time. I wish I’d gotten to it earlier. Four out of Five Stars. I also wrote a review yesterday for Out of the Easy by Ruta Sepetys. Yes, that is a review every day since my last WWW Wednesday! I’ve had so many good books to review. This book blew me away and I think I may soon have a new favorite YA author. I gave the book Five out of Five stars, changing my rating when I started reviewing it and realized I had nothing bad to say about it. Reading Next: I’ll need a new car audiobook soon and the next up is one I’m very excited about, Simon vs. the Homo Sapiens Agenda by Becky Albertalli. I’ve been wanting to read this one for a while and I’m getting giddy about starting it soon. Currently reading: I haven’t had as much time to read Origin by Dan Brown as I would like. Work has been crazy and lunches have been short to help squeeze in more training time before and after work. I feel like I’m coming close to a climax, but I have a lot to go still, too. I’m enjoying Books for Living by Will Schwalbe and am moving through it faster than I thought I would. I’ll probably finish it this weekend so I’ll have a review soon! So far it’s only added one book to my TBR so I’ll consider that a win. I’ve been flying through The Wednesday Sisters by Meg Waite Clayton and hope to finish it this week, too. It was recommended to me when I told a family friend about my old writing group. It’s giving me flashbacks to that group and I really miss my Novel Girls! Out of the Easy by Ruta Sepetys has been a really fun eaudiobook while I’m training. It’s a very escapist plot and when I’m suffering on the bike, it’s very needed! I still have a while to go on this one, but I’m being optimistic I can finish it this week, too! Wouldn’t that be amazing if I finished three?! Recently finished: No surprise to me that after finishing three last week, I don’t have anything on here this week. Though next week it should be stacked! Reading Next: My hold on Thunderstruck by Erik Larson came in so I’ll start it as soon as I finish Sepetys. I’m excited to hear another Larson story because he always keeps me so entertained!